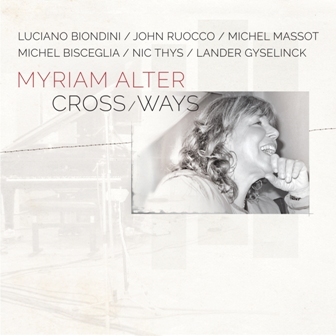 Crossways is composer/pianist Myriam Alter's third production for Enja Records (licensed to Justin Time Records in North America). Her mother grew up in Saloniki, which has given Greece some of its greatest musicians, artists, poets and thinkers, thus providing a rich background for Alter to draw upon. Her father was born in Istanbul and lived there until he was seventeen when he moved to Belgium. Being brought up around these different cultural influences left an imprint on Alter and has influenced her music and compositions throughout her life. Alter gathered a standout ensemble, with diverse cultural backgrounds like her own, to come from all over the world to produce the tight overall sound on Crossways. At the center of the music is Italian accordion virtuoso Luciano Biondin. He is joined by American (now Netherlands based) clarinetist John Ruocco, who fulfills an important soloist role in a similar fashion to his role on Alter's previous albums. Belgian bassist Nic Thys always impresses with his strong acoustic bass foundation, and the liquid tuba of Belgian Michel Massot will be a discovery for many. The creative young Dutch percussionist Landers Gyselinck provides steady rhythmic support and is making a name for himself in both the jazz and the avant-garde rock scene, and Italian Michel Bisceglia provides subtle, crisp piano solos with his arrangements that truly balance and support the compositions. "I chose Crossways because of my own upbringing, I came from a Judeo-Spanish family and lived in Belgium," says Alter. "Once you add that to the background of these musicians, all those cultures meet in the music." Crossways not only refers to the diversity and eclecticism in the musicians backgrounds but also to the instrumentation for the album. The unique combination of accordion, clarinet, and tuba along with the traditional instrumentation adds a distinctive element to Alter's music that is undeniable and also adds succinctly to the warm melodies throughout the recording. Although most of the performances were improvised, the melodies were arranged to evoke a certain feeling of peacefulness and tranquility. For Alter, it's the feelings of nostalgia in the arrangements that provoke these feelings that she hopes draw the listener back. "I want these melodies to create a warm and loving feeling so the melody really sticks with the listener," explains the composer. The album concludes with a beautiful and spontaneous solo piano piece performed by Alter, dedicated to Mal Waldron. The two met in Brussels and had become good friends with Alter inviting him to workshops, taking lessons with him and watching him perform on a weekly basis. The moving performance serves as a fantastic end of to this exciting production. Crossways is sure to be a landmark recording for this composer/pianist.